St Augustine of Canterbury: 50 years celebrated in 1 fantastic evening! 50 years celebrated in 1 fantastic evening! The community of St Augustine of Canterbury celebrated in style in Downend on Wed 30th September with a wonderful Mass of Thanksgiving, led by Bishop Declan together with 15 other priests and many Deacons, all in front of invited local dignitaries and a packed congregation of parishioners, old and new. Before the Mass began we enjoyed songs and hymns sung beautifully by St Augustine’s Primary School choir who were led by the Head teacher, Julian Clements. The offertory procession was taken up by a selection of parishioners who were here 50 years ago when the Church community began as well as representatives from our most recent Confirmation and 1st Holy Communion programmes showing the bright future of our Church. All our music groups were involved in the liturgy during the evening, 15 of our altar servers were delighted to serve at the special Mass and a large team of people worked hard to make the whole evening a great success. During his homily, Bishop Declan spoke about the fact that we are not just celebrating 50 years of the church building being complete, but more than that, this marks 50 years of building a thriving Church Community. He presented Fr Frank with a beautiful Papal Blessing, given to the priest and people of St Augustine’s on this wonderful occasion. Each family was given a commemorative booklet after Mass (Fr Frank joked that it wasn’t given out on arrival in case people read it instead of paying attention to Bishop Declan’s homily)! The booklet gives lots detail about the history of the Parish with many memories and photographs from those early days and events throughout the 50 years. The forward from Fr Frank talks of ‘community’ being a beautiful title as it symbolises unity and togetherness and that, in marking this special occasion, we are giving thanks to God for the many blessings He has bestowed on our community and we are looking forward to the future with confidence. The celebrations continued after Mass in the school hall with speeches, cutting of a wonderful cake depicting a 3D icing sugar model of the church in 1965, groaning tables of food, glorious food and lots of catching up between friends old and new. What a wonderful evening it was. 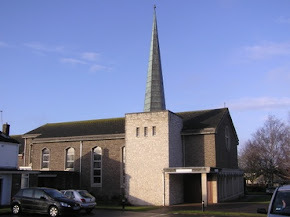 Thank you to everyone that organised it and to the parishioner of 50 years ago who built our wonderful parish.